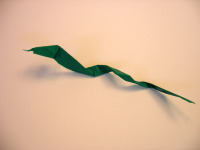 This origami snake is easy to fold and fun to shape into a variety of positions. This model is adapted from one in the book Origami by Toyoaki Kawai. A nice home for this snake would be the greenery on top of a fish bowl with an origami fish, like the one below, or any houseplant. For the fish bowl how-to, click the photo or click here. For the fish folding instructions, click here. If you'd like to put your snake outside—in a flowerpot, for example, you can! 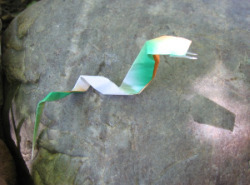 Just be sure to weatherproof your paper before folding the snake. Click here for the how-to. 1. Start with the paper white side up. Fold in half, corner to corner. 2. Unfold. Fold two adjacent edges to the center crease. 3. Fold the remaining two edges to the center crease. Notice the diamond shape in the center. 5. Cut the paper along the creases marking the diamond shape. 6. Fold two adjacent edges to the center crease. 7. Fold the same two edges to the center again. Try to keep the tip as neat as possible. 8. Fold the remaining two cut edges to the center crease. 9. Fold in half along the entire length. 10. Unfold. Fold the head tip down as shown. 11. Fold the tip back as shown. 12. If you want your snake to have a forked tongue, cut the tip in half. 13. Now we're going to make the head. Start by folding as shown. 14. Unfold the last step. Open the head and pinch in as shown. This is an outside reverse fold. 15. To shape the body, simply twist and crease several times to your liking. The snake in the second photo here appears to be slithering along. Can you make your origami snake rise up in strike position?